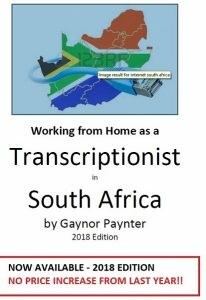 This transcription e-book is packed with everything you need to know about working from home as a transcriptionist in South Africa. Or conveniently purchase over the internet / email. I started out as a transcriptionist in 2005 and I’ve included everything I’ve learned along the way that I wish someone had told me. It’s an essential resource for transcriptionists starting out and for those who just want to brush up on their business skills. The e-book goes into how to bring in business and run your own home business utilising the skills you have, and be self employed – leaving the employee mindset behind. “Gaynor Paynter has written a down to earth, user-friendly transcription e-book based on her own personal experience. It’s easy to read and mostly comprehensive.” – Michelle Nel, freelance environmentalist journalist. Contact me to place your order today. 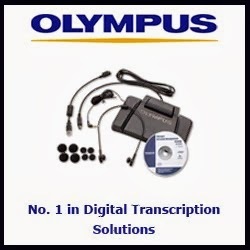 Who should purchase this transcription e-book? People starting out in the industry who want to know more about running their business, more about working from home and more about the challenges we face as workers in South Africa as well as those with experience who want to brush up on their knowledge, and become self-employed utilising the skills that they have. With self-employment comes the running of a business including marketing which you may not have learned while being employed. Why does the title refer specifically to transcription in South Africa? Running your own business in South Africa has particular challenges which people in first world countries do not have. We have to deal with things like load shedding, water crises, high crime rate, poor service delivery – issues which are not relevant in other countries. My transcription e-book touches on all these aspects as well as the more generic things required by those who wish to run their own business and APA paper format for students – how to get and retain clients, how to invoice, professionalism, marketing – etc. 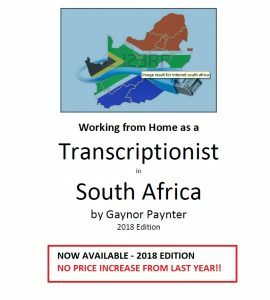 How much does ‘Working From Home as a Transcriptionist in South Africa’ cost? How do I order this informative e-book?